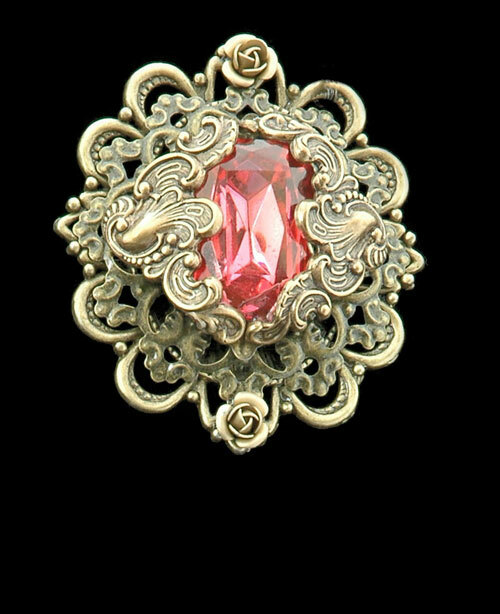 This incredible rose colored Swarovski crystal is the centerpiece here engulfed in lovely Nouveau swirls and flourishes. It rests on an intricate backing of antiqued gold brass and I've accented it with 2 tiny metal roses at either end. This elegant beauty is ready for you to wear as a brooch or as a necklace from the 2 tiny hooks set on the back using your favorite chain.